Your love and financial support allow us to bring Project LIGHT – a new form of sustainable humanitarian aid - to those who need it most around the world. We are deeply grateful for the opportunity to share the heart of our work with you through our award-winning documentary. View or Download the Movie Now! Join our mailing list to receive the download link for the movie When I Was Young I Said I Would Be Happy. 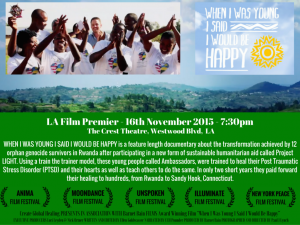 WHEN I WAS YOUNG I SAID I WOULD BE HAPPY is a feature length documentary about the transformation achieved by 12 orphan genocide survivors in Rwanda after participating in a new form of sustainable humanitarian aid based on Energy psychology called Project LIGHT. Using a train the trainer model, these young people called Ambassadors, were trained to heal their Post Traumatic Stress Disorder (PTSD) and their hearts as well as teach others to do the same. In only two short years they paid forward their healing to hundreds, from Rwanda to Sandy Hook, Connecticut. I left my dark inner world and moved into a shining world. Now I know everything is possible. We are ready to be a LIGHT for our world. Imagine Project LIGHT Programs all over the world where young people are given the opportunity to heal, work and lead us into a peaceful future. Project LIGHT delivers state of the art, brain-based trauma healing techniques, break-through heart centered leadership and peace building training, and economic sustainability opportunities. With our hearts aligned, I am more convinced than ever that we can create global healing in our lifetime.